For fans of Dungeons & Dragons, Audible has released an anthology of R.A Salvatore’s stories in honor of the 40th anniversary. And for a limited time, it’s completely free to download. Since 2013, Audible has hosted a dedicated Dungeons & Dragons page to showcase available titles. This week, Audible gives something back to the fans by posting The Legend of Drizzt. 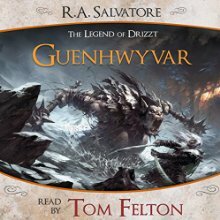 Featuring the collected stories of the well-known dark elf, Drizzt, the collection is read by stars from Harry Potter, The Lord of the Rings, The X-Files, The Big Bang Theory, Star Trek: The Next Generation such Ice-T, Sean Astin, Felicia Day, Al Yankovic, and David Duchovny. For a limited time, readers can download the entire collection or pick and choose their favorites. …why would this article not have a link to the audible page? what am I missing? have I gone stircrazy? So I listened to the Ice – T recording while driving to GenCon, and my life is now complete. I have heard him talk about a pegasus named Sunrise, and lavender eyes, and drow grinning. That’s really all I needed.